Games at their basic level focus on a clear goal that the player must reach whilst adhering to a set of rules. As they progress towards their goal, they are presented with a series of problems or obstacles to deal with until they succeed and are rewarded for their achievement. Game-based learning is an approach that uses games as a vehicle to provide education or training. If you are creating games for learning, it is imperative that the learning goal is the driving force and that the player acquires new skills, knowledge or change of attitude. The game-based learning approach differs to Gamification. 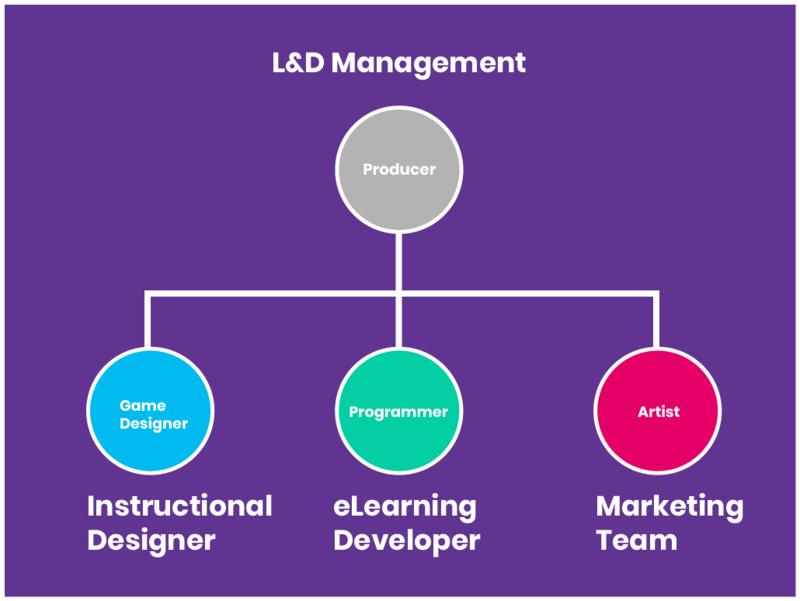 In Gamification, rather than present a fully fledged game, you selectively add individual game elements to course content or to the Learning Management System (LMS). The visual style of games is affected by the type of graphics used and themes applied. Graphics can range from flat 2D to fully animated 3D models inside Virtual Reality (VR) worlds. Themes include adventure, fantasy, historical and modern workplace. As a game designer, it is important to play various types of games in terms of format and style in order to build a game literacy that can be drawn upon when designing their own games. Why is game-based learning used? People’s exposure to games is greater than ever before with the increased use of smartphones and prevalence of games embedded in social media apps. Games include many elements that engage, motivate and focus the attention of the player. In a learning context, when someone is focused the effectiveness of learning is increased. With all of these possible elements to include in your game, it is important to strike the right balance between skill and challenge. People have a high degree of concentration and happiness during games due to a something called flow. Mihály Csíkszentmihályi’s flow model shows that an optimum channel exists where the difficulty of challenge is mapped to an appropriate skill level. If the player is presented with an activity that is too difficult and they don’t possess a high enough skill level they will become anxious. On the other hand, if their skill level is high but the challenge is easy, they will quickly become bored. 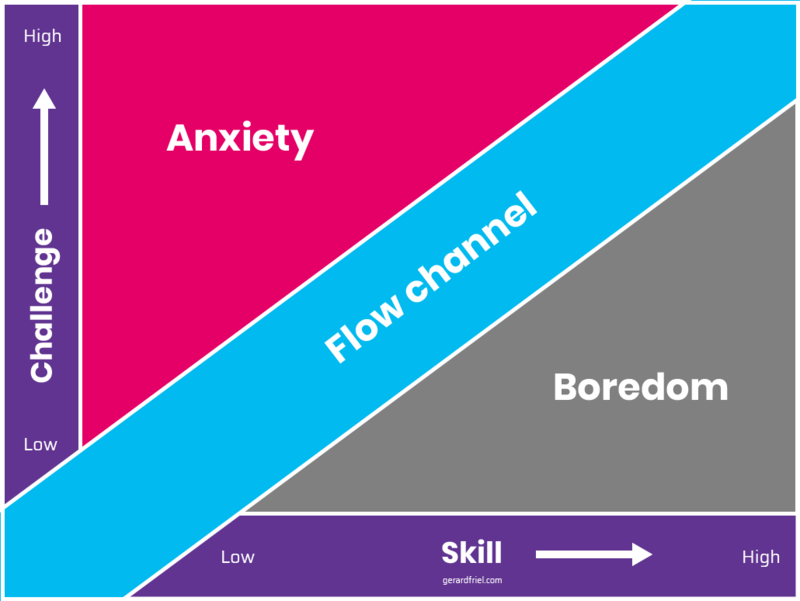 Flow has to be carefully managed so the player remains completely focused on the activity without falling into the anxious or bored zones. How do you create games? The barriers of implementing a game-based learning solution are declining rapidly. Traditionally, game development was expensive due to high software costs and the specialised roles (such as game programmers) required to build them. This meant that only the large budgets of the military and aviation business saw major game-based learning deployments. Most game engines also have a scripting component, so programmers can ‘get under the hood’ and customise the game even further. The high-end game engines have a steeper learning curve with a sophisticated user interface that allows the creation of virtual (VR) and augmented (AR) reality experiences. High-end commercial games (known as ‘triple A’) can have over 100 people working on them for three years with a budget running into the tens of millions of dollars. At the other end, an independent game can have between one and three people working over a few of months with a budget of $50K. A small team will usually have four defined roles with all having an input into how the game is developed. Performance problems: start by analysing the performance issues. Learning objectives: create learning objectives that solve the issues. These learning objectives will guide you through the whole development process. Concept doc: create a one to two page document that provides a holistic view of the game that includes style, theme, gameplay. This should be just enough to get designing. Iterative design: create non-digital prototypes and playtest with the team, stakeholders and learner population. Use the feedback from the tests to inform the next iteration of design. Prototyping in this fashion makes it easier and cheaper to make changes to the game design than it would if programming and artwork had been applied. Design document: The design document can take many forms, either a document, a collection of lists or information held online. The purpose of this ‘document’ is to communicate design decisions between team members and can consist of programming and graphic design to-do lists. Iterative development: develop small components of the game (such as interactions or levels) and enter incremental playtest, feedback, evaluate and development loops. Output: Deliver the game. This usually occurs when budget or time constraints are met. Following the seven steps will ensure that the game is focused on a learning outcome and is adequately tested before release to your audience group. Pros: Highly engaging form of delivery that enhances the learning process. Cons: Can be complex to create. Difficult to estimate game delivery date early in the process.